First off, I love pasta! Any kind, any shape! I have pasta at least two or three times a week, if not more. I think it might have to do a little with my childhood. My Dad was in the Air Force and after I was born, he was stationed in Aviano, Italy. We lived there for about three and a half years. Of course being that young you could hardly remember much, but there are a few things I do remember at that age. We lived next door to our landlord. They were a typical Italian family and they became good friends of my family. While my parents were working and my brother was at school, our landlord's wife would babysit me, and I would play with her son who was my age. Needless to say, I ate a lot of traditional Italian food at a very young age. I wish I could remember how it all tasted! So I'm thinking my love for pasta, Italian food, and for Italy comes from my early childhood. One thing I have never tried making is fresh, homemade pasta. That of course changed when I was watching a show called "Playing with Fire" on the E! Network. The series chronicles the personal and professional lives of five chefs, stars and taste-makers who have risen to the top of New York's culinary world. One of the chefs is Anna Boiardi. She is the granddaughter and niece of the founders of Chef Boyardee. 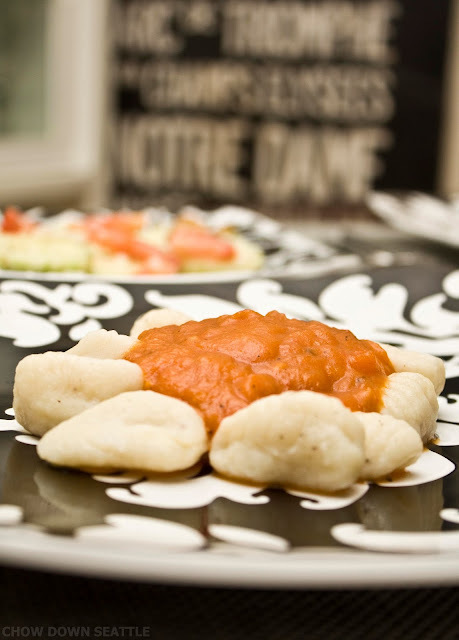 In one of the episodes, Anna's Mother prepared homemade ravioli for her grandson. As I watched this, I thought to myself, how hard could it actually be to make fresh ravioli? Of course I was watching an Italian from a pasta empire prepare fresh pasta, so it's second nature to her. So, in my pursuit to make fresh pasta, I did some research on recipes and techniques. Luckily, my best friend's Mom had the pasta attachment for her Kitchen Aid mixer. She let me borrow it to use it on my mixer. 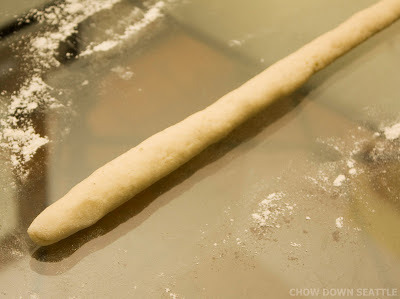 I made some basic pasta dough and went to work making some fettuccine. It turned out pretty good. It tasted way better than store bought pasta. I then experimented with some cheese ravioli, and that turned out pretty good too! 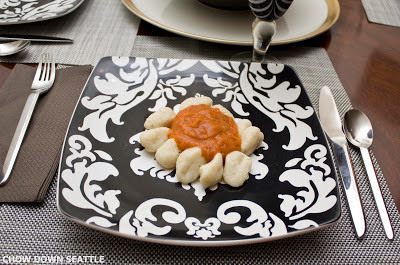 So, my next challenge was to make some fresh gnocchi, one of my favorite pasta dishes. I had a gift card from Sur la Table that I received at Christmas. 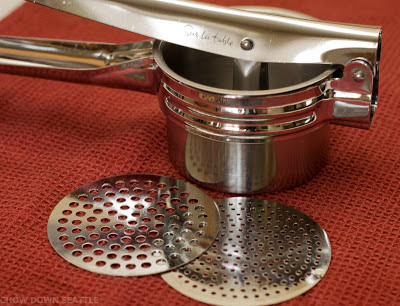 I had been contemplating what to purchase with it, and then after researching some pasta tools, I ended up buying a potato ricer, a gnocchi board, a ravioli stamp, and a ravioli maker. I'm very pleased with my purchases. 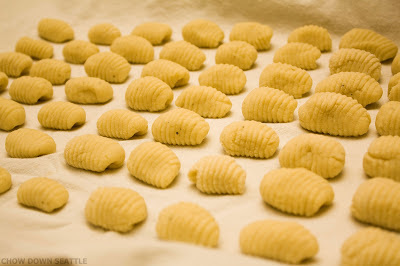 This past weekend I took on the task of making fresh gnocchi. It's quite a long process, but my gnocchi turned out pretty good for my first crack at it. I used a recipe for the gnocchi from Lidia's Italian Table. I wanted to share the experience of my first try at fresh gnocchi. Potato ricer used to rice potatoes. Sometimes used as an alternative to mashing potatoes. 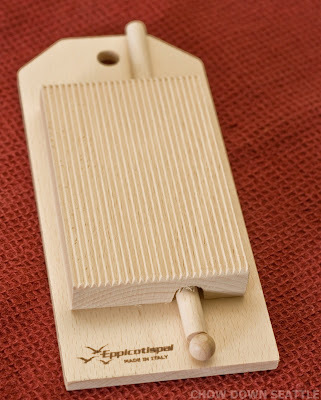 Gnocchi Board is used to add ridges to gnocchi and other pastas. The first step in the recipe is to boil three russet potatoes for about 40 minutes. Once they are peeled, they are riced using a ricer. 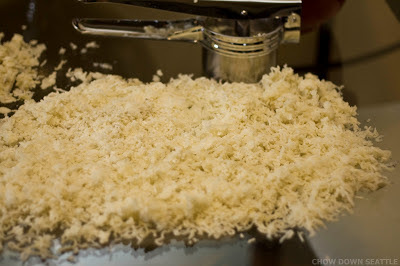 Once the potatoes are riced, they look basically like raw hash browns. After the potatoes have cooled, they are formed into a mound resembling a volcano. An egg mixture is added to the center. 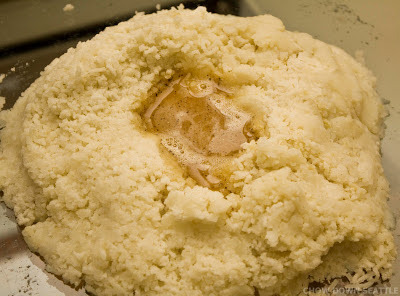 Flour is added to the mound, and the mixture is slowly incorporated and kneaded together to form a nice ball of pasta. After forming a pasta ball, it is cut into six equal pieces. Each piece is rolled out into a rope that is about 1/2 inch thick. Once the pasta is rolled out into a rope, it is cut into 1/2 inch pieces. 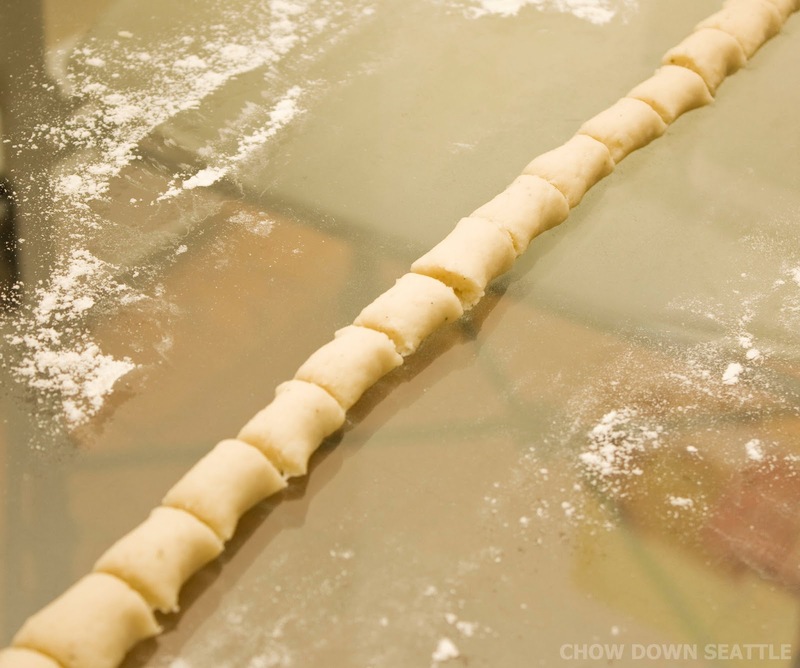 After the pasta rope is cut into 1/2 inch pieces, each piece is rolled by hand into a small ball. 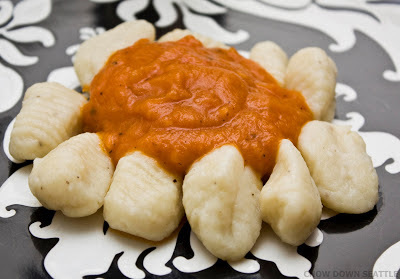 The pasta ball is then placed against the gnocchi board and pushed down using your thumb. The gnocchi board imprints the perfect ridges in the pasta as it rolls down the board. The gnocchi is then placed on a towel-lined baking sheet in preparation to be placed in boiling water. The gnocchi is then placed into boiling water. Once the gnocchi starts floating to the top of the water, it is then boiled for about one more minute. The gnocchi is then removed from the water using a slotted spoon. The gnocchi is then ready to be paired with your favorite pasta sauce for serving. For my Birthday, I received a bottle of Dave's Gourmet Butternut Squash Pasta Sauce. 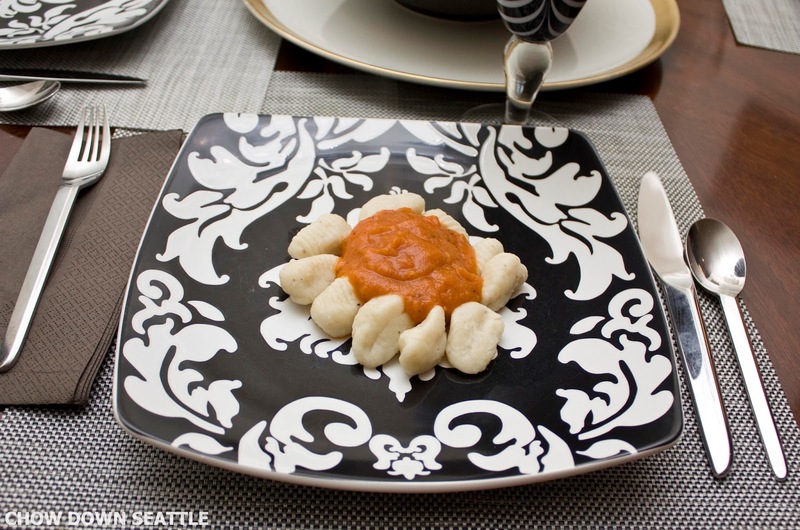 I decided to use this pasta sauce for my gnocchi and I'm glad I did! It's delicious! I highly recommend it. My gnocchi turned out much better than I would have expected for my first try. It was tender and not tough or chewy. It was the perfect size and texture. I was very encouraged by how my gnocchi turned out. I'm already looking forward to making my next batch. I want to experiment with different sauces and meats to add to the pasta. I'm excited to also mak3 many different kinds of pasta. I want to make more fettuccine and ravioli, as well as making some tortellini. I want to explore the wonderful world of Italian cuisine, so be prepared for more pasta blog posts! Mangia! Mangia!